THESE DAYS American foreign policy is a hard sell. In the 25 countries polled by the Pew Research Centre, trust in Donald Trump to do the right thing languishes below the ratings for Xi Jinping and Vladimir Putin. When Vice-President Mike Pence paused for applause for his boss at the Munich Security Conference, he was met by an embarrassing silence. 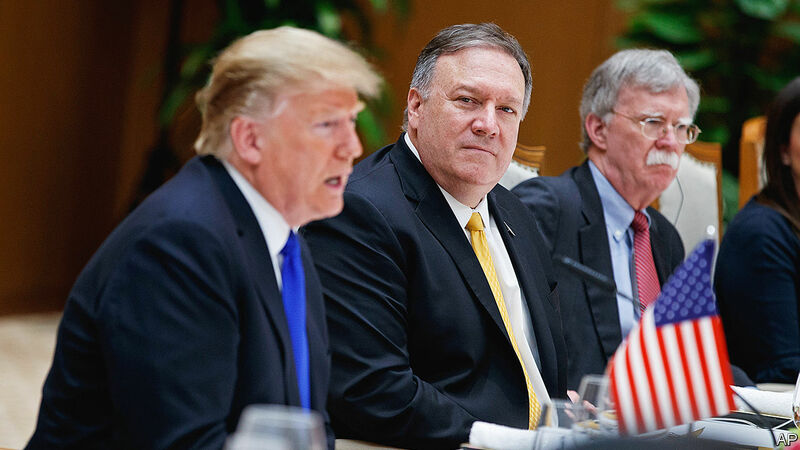 Mike Pompeo, the secretary of state and a faithful preacher of the Trump gospel, has his work cut out to persuade people that America remains “an enormous force for good all across the world,” as he told this newspaper recently. Mr Trump’s policies will in the end be judged by results—and crucial tests loom on several fronts. One is in Venezuela, where he is championing efforts to topple Nicolás Maduro. He was quick to recognise Juan Guaidó, who declared himself interim president in January. But Mr Maduro is refusing to budge, and is blocking efforts to deliver aid despite what Mr Pompeo calls “the largest humanitarian crisis in the history of man absent armed conflict”. The conflict threatens to escalate, in a high-stakes trial of America’s ability to prevail in its own region. The stakes are even higher with North Korea. Mr Pompeo accompanied Mr Trump to Hanoi with Mr Pompeo for a second summit with Kim Jong Un. In advance Mr Pompeo said he hoped for “a substantial step forward” towards “the full and final denuclearisation of the Korean peninsula”. Little progress was made on that. A giant test also looms on China. On February 24th Mr Trump put off the steep rise in tariffs on $200bn-worth of Chinese goods that was threatened for March 1st, citing progress in trade talks. He even dangled the prospect of a summit soon with Mr Xi in Florida to sign a deal. But any deal that tackles America’s trade deficit with China, without bringing convincing concessions on the more fundamental ways China exerts influence through state involvement in the economy, will draw accusations that Mr Trump has allowed himself to be duped. Mr Pompeo himself is playing on, he has ruled out a Senate run in Kansas. Since his transfer from the CIA last April he has tried to restore “swagger” to the State Department—not boastfulness, he stresses, but pride. Even with better management, however, the policies remain Mr Trump’s. And they are entering testing times.